After you practice a bit, find a yarn/knitting store in your area. You are in Texas, right? Bring your knitting with you and ask if someone can take a look and see if you are doing it right. You never know, you might meet some nice knitters. We knitter are usually a friendly bunch. 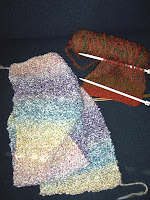 Buy some chunky yarn and big needles (again ask someone to help you) and cast on for a scarf. Chunky yarn and big needles is a way to get a scarf done in no time. Whatever it looks like, finished is better than perfect and you will feel accomplished and then the bug might get you. Well I'm happy to report that due to my WoW break, I have finished my first RL quest! I wrote JoJo to tell her that I finished the quest, she replied back "Gratz, you have just learned a whole bunch of XP and have Dinged/Bonged to the next level"
I had to ask her what a skein is. heheheh.. it's a ballish bundle of yarn apparently! Thanks JoJo for the motivation! Maybe eventually you can learn to knit with wire and make some real chain mail. Hehehehe.